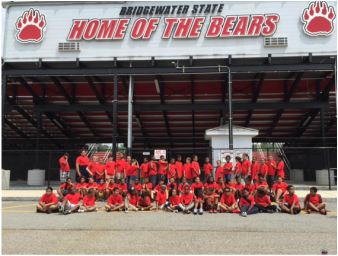 This Spotlight focuses on how the staff of the Raymond School in Brockton, with support from district administrators and ESE staff, worked together on a turnaround plan that dramatically increased student growth. In three years, the average Student Growth Percentile (SGP) in mathematics at the Raymond School increased from 39 (2014) to 59.5 (2016) on the state assessment. We invited the Instructional Leadership Team of the Raymond School to write about the planning and implementation of their turnaround efforts. In the summer of 2014, the Raymond K-8 School’s MCAS results showed that while students in the middle school grades demonstrated high levels of proficiency, the scores in grades 3-5 were the lowest in the district. This disparity had become a pattern and ESE designated Raymond a Level 3 school. June Saba-Maguire, Executive Director of Teaching and Learning, PreK-5, worked with ESE staff to devise a plan to address the needs of Raymond’s grade 3-5 students. The guiding question was: why are the middle school students making steady and consistent gains from year to year, yet the elementary school scores are consistently lagging? With their plan in place, Principal Carol McGrath and Saba-Maguire took action. They built a redesign team with representatives from the district, school-based leaders, classroom teachers and educators of special disciplines. The team began work with a deep dive into a cross section of school data, including student outcomes and perception surveys. The data review helped the team understand the school’s strengths and challenges. The team presented their findings to the entire school staff and then conducted a root cause analysis to determine the critical needs that required urgent attention. The analysis produced enlightening discoveries. The staff learned that most of the causes for the low student achievement were actually things under their control, mostly related to curriculum quality, school climate, and culture. These findings prompted the creation of three dedicated work groups - Instruction, Structure, and Culture. Every member of the school staff joined a group. The Instruction group’s work involved a great deal of collaboration. The leadership team and grade-level teams at Raymond enlisted support from an ESE math content specialist to address the school’s instructional need in mathematics. For example, professional development and common lesson planning about supporting Math Talks were designed to increase rigor, student discourse, and the use of varied problem solving strategies in math classrooms. ESE’s support was instrumental to unpacking expectations for students in the state standards. The Instruction group’s efforts led to creating time for educators to collaborate in vertical teams. Through vertical articulation, the Instruction team aligned curriculum expectations and instructional approaches by establishing protocols for class discussions, aligning instructional schedules and time on learning, using common language and common instructional strategies, and committing to deepening students’ conceptual understanding of math across grades. Not only have MCAS scores improved, the Raymond School now has deeper professional dialogues that focus on how instructional practices impact and contribute to students’ success. The work groups continue at the Raymond School. The Structure and Culture teams have seen positive initiatives come to fruition and have made great progress in promoting a more positive and cohesive climate for both staff and students. As progress becomes more apparent through data, the faculty is empowered by their ownership of the work. Although the three work groups recognize continuing needs, they are focused on solutions, empowered by results, and encouraged by school, district and state-based collaboration. For more information about the Raymond School’s turnaround, please contact Brockton Public Schools. The PDS newsletter provides great information that focuses on the learning experiences of the students who are involved with our district partners. It showcases the great work and knowledge that is being shared. Due to the large volume of graphics and text it may take a few moments to download the newsletters.